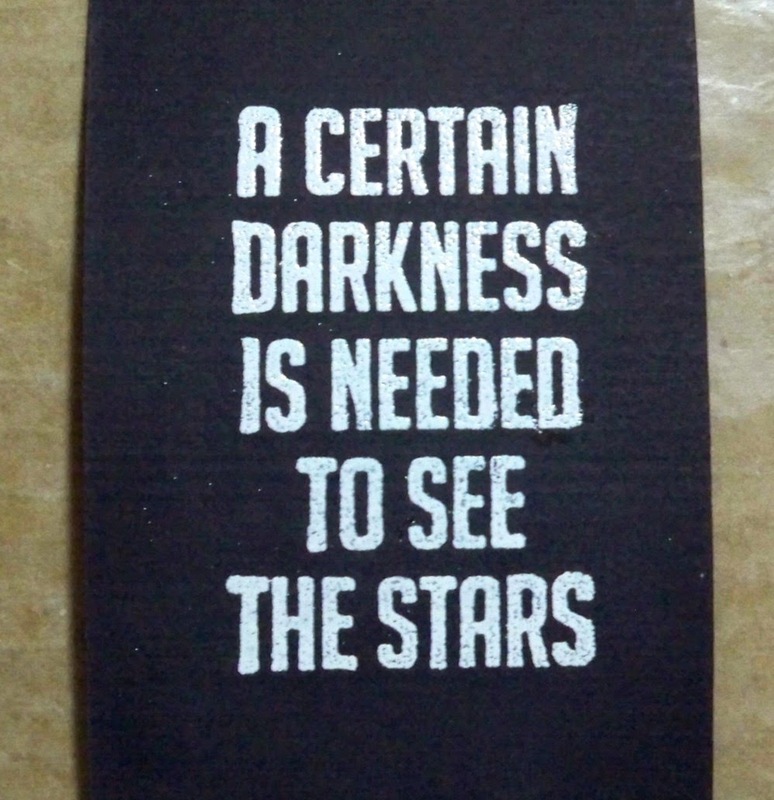 SweetStamps BLOG: A Certain Darkness. . . I know everyone is making pretty spring cards and projects but I am stuck on a quote kick, plus I got a bunch of new stamps from Unity Stamp Company. And, I found the base paper hiding in my stash, unopened, where it has sat for a very long time (the company I bought it from is out of business, but if you do a web search you can find it). I am on a mission to use my supplies (I am still buying new stuff, but that can be our little secret) so I wanted to use this paper. I am very pleased with how this card turned out and I hope you agree! Not sure why this one looks a little blue. . .
First thing I did was take four of the small stars from the Tiny Hearts, Flowers, Stars and Flourishes set – I need to order that set again as I have no more stars left. I embossed them with Siam Silver Embossing Enamel after coating them with Embossing Fluid. I just have to say, I have been using this bottle of Embossing Fluid, at least weekly, since January and I haven’t even put a dent in it. And the dauber delivery system is SO much easier to use than a typical embossing pad, plus, I pried the top off and put a small amount in an old pill bottle to use for painting the Embossing Fluid on. Love this stuff! Sorry, I got distracted <grin>. I completely ruined one of the stars (don’t drop newly embossed items on the floor when you have four very furry cats) so that left me with 3 stars. I knew I needed more, so I punched some out using the heavy silver cardstock. 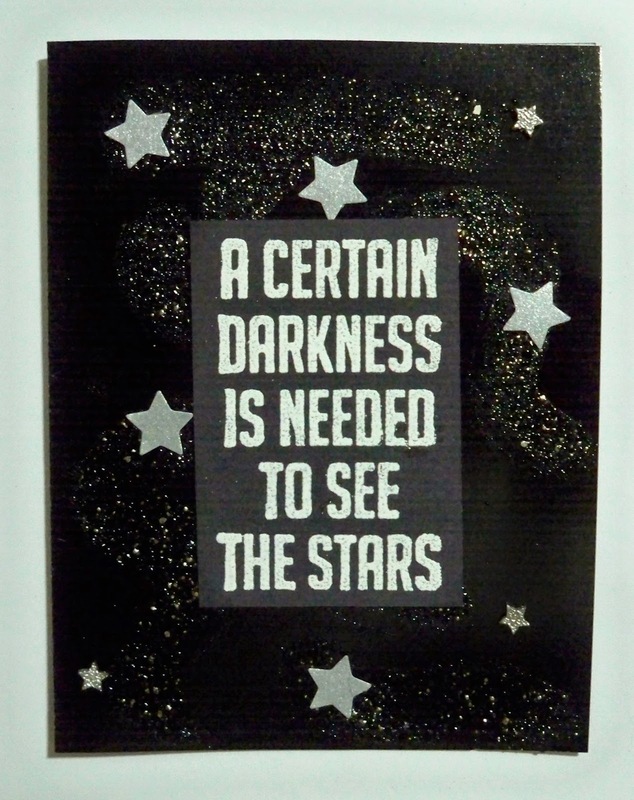 Next, I embossed the sentiment with the Micro White Embossing Enamel on a scrap piece of black cardstock. Now, I have never had good luck with white embossing, ever. I use my little pouch thingie to ensure there is no stray powder but I could never seem to get a clean emboss. I did here! I am thrilled with this stuff! I trimmed the sentiment down so it was even. It was then I decided to try something new. I knew I could emboss on glossy cardstock, so I thought I’d give it a whirl on this plastisheen. All I did was use the Embossing Fluid and I swiped it on the card, right out of the bottle. 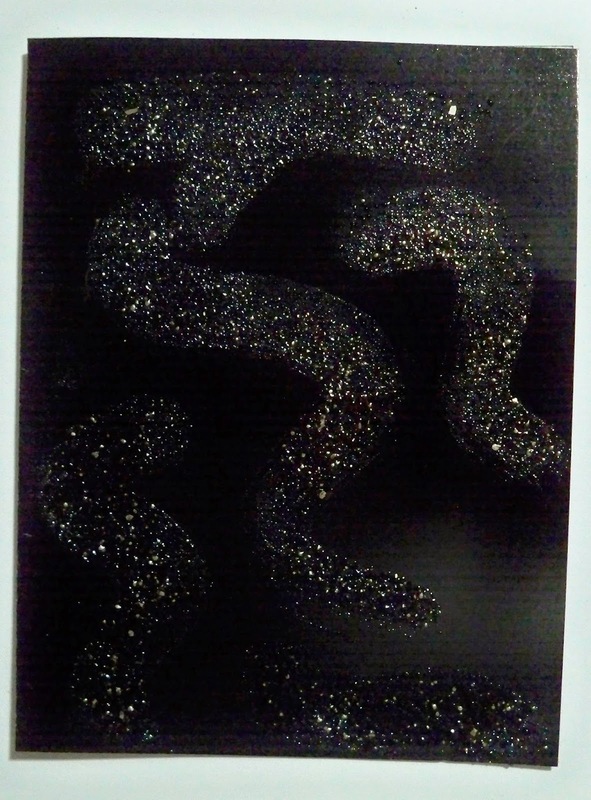 Then I embossed my swipes with Starry Sky Embossing Enamel. I love the texture (such a big thing now!) and it was so fun! I love to try new things; especially when they work out! 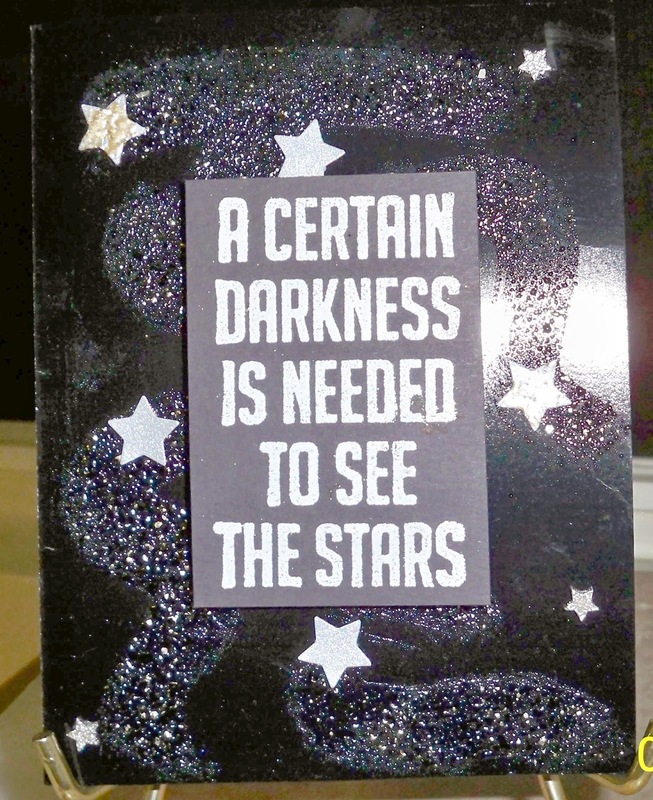 So, now I have my background done, my sentiment and my stars. I pieced it together and felt something was missing. 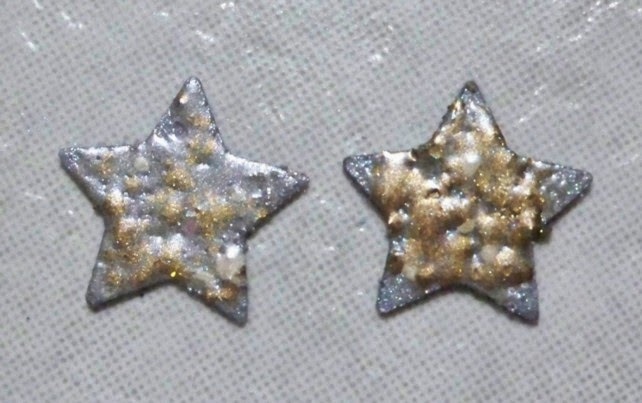 After debating how to give the card some more interest, I took 2 of the cardstock silver stars and embossed them with Mermaid Tears. Definitely gave the card a little more pizzazz! 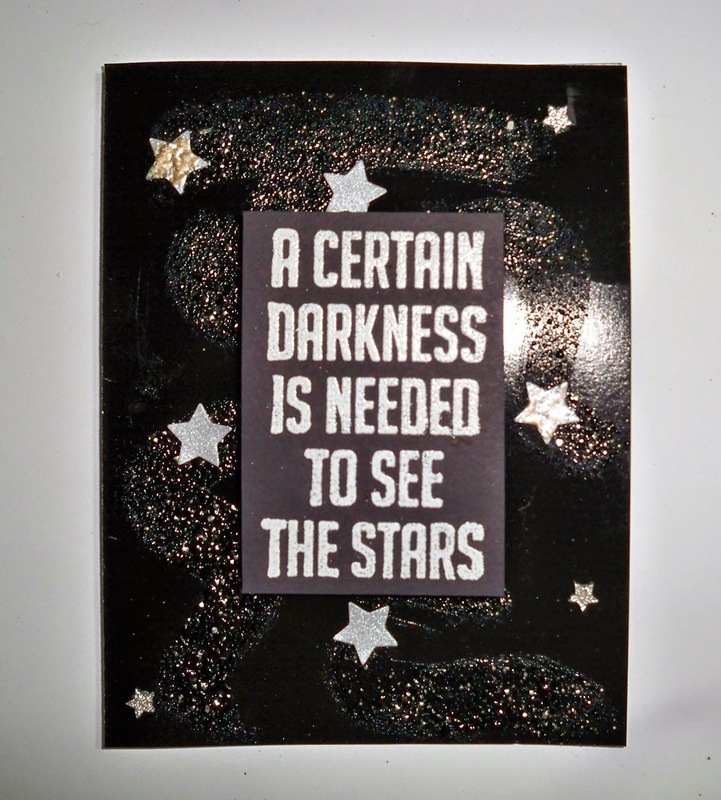 After I glued my stars where I wanted them, I pop dotted the sentiment, adhered that and we have liftoff! I was amazed to see the purple pop out in this picture! And the last picture of the finished product! It is very difficult to get a good picture of a black glossy card! 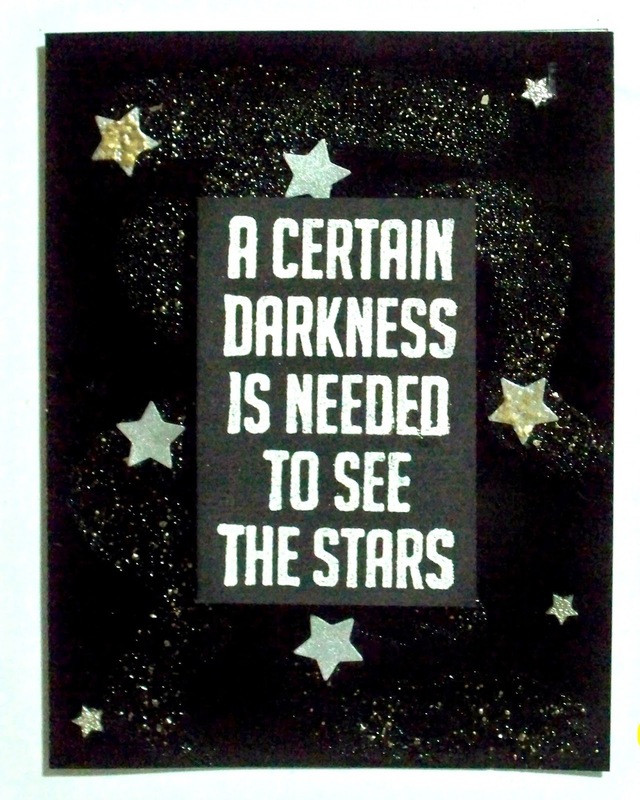 Beautiful card, love the starry night.